Isn’t amazing how one can bake so many different cookies by just adding some more ingredients or interchanging ingredients to the basic cookie dough. I love oatmeal and coconut so no wonder I had to bake these cookies. Instead of the usual chocolate chips I added some dried cranberries. My neighbours know when I am baking as they claim that the smell of freshly baked goods reaches their homes. The cookies hardly lasted for a few days. I will be baking another batch pretty soon. Cannot plan when as these days we are facing a lot of power cuts. 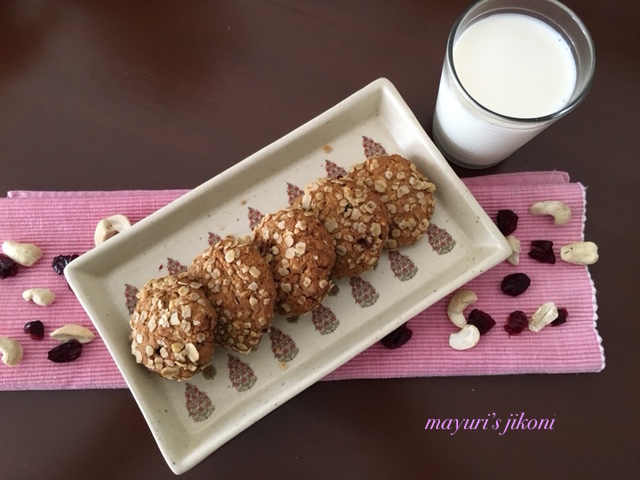 Make these cookies to treat yourself to a sweet snack with either a hot cup of tea, coffee or milk. Don’t forget to dunk them….. tastes the best! Preheat the oven to 180°C. Grease the baking lightly with butter. Sieve the flours and baking soda together. Add oatmeal, coconut and dried cranberries to the flours. Mix well. Add the milk, orange zest and lemon juice and mix well. Add the flour mixture and mix till all the flour is wet. Take tablespoonful of the dough and roll it into a ball. Flatten it slightly by pressing between your palms. Place them on the greased tray about an inch apart. Bake them for 12 to 15 minutes or till the edges are brown. Leave the cookies on the tray for 3 to 4 minutes. Remove them from the tray and place them on a wire rack. When the cookies are cool completely, store them in an airtight container. If you want to add fruit and chocolate chips together use half of each. Depending on the flours and oatmeal you may need only ½ cup of milk. Add additional milk if the dough is dry. Instead of orange zest use vanilla extract. Can use a fork to flatten the cookies slightly before baking. Leave the dough in the fridge for 30 minutes if you find it is too soft to roll. Absolutely perfect cooking .. They are super healthy .